Who puts stars in your eyes and smiles on your faces? M-I-N-N-I-E! 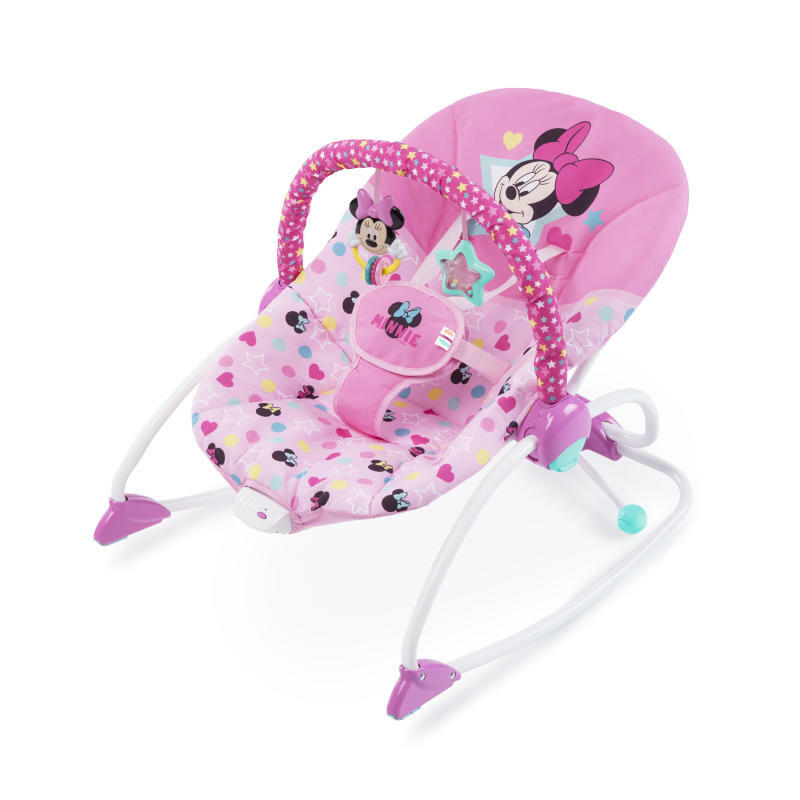 Minnie Mouse's happy grin is contagious and this preciously pink rocker makes just the right spot for your sweet one. When you nestle her in the cozy baby seat, Minnie’s bow is perfectly placed right above her head! That’s a photo shoot waiting to happen. Listen to your baby coo with contentment when you activate soothing vibrations. Includes a rear kickstand to switch from rocker to stationary seat. The removable toy bar has Minnie Mouse-approved activities that make rocking time magical. The seat pad is also easy to remove, so you can toss it in the washing machine for no muss, no fuss freshening up. Switch from rocker to stationary seat from baby to toddler years. Every rock feels like a hug from Minnie Mouse herself! Seat pad - Machine wash with cold water, gentle cycle.Toy bar and toys – Wipe clean with a damp cloth and mild soap. Air dry. Do not immerse in waterFrame – Wipe the metal frame with soft, clean cloth and mild soap.